DISCLAIMER: I am merely providing you what I know about Virtual Vintage Technology in this article/post. What you do with this knowledge is up to you and I am not responsible for anything should you decide to mod your pickups or something. I've been getting some questions recently on what exactly is Virtual Vintage Technology that Dimarzio seems to be pushing recently on their newer pickups. Typically when you see the term virtual vintage next to a dimarzio pickup you think it's gotta be a vintage output pickup but you also find it in pickups like the D-Sonic, Evo2 & Paf Joe. It's never advertised or mentioned that those pickups have "Virtual Vintage Technology". but they do. Don't believe me, go check out the DiMarzio site and look at the various pickups and check out the Patents listed under each pickup. If you see a pickup with patent # 5908998 or 5,908,998 (same number with comma spacing), it's got the virtual vintage technology in it. FIrst, allow me to explain what exactly DiMarzio has done to create "Virtual Vintage Technology". When it comes to pickups, there are three main attributes that make up everything. Inductance, Resistance and Capacitance. While Resistance and Capacitance do play a part in pickup design, a pickup's inductance (or it's ability to generate voltage) is probably the biggest factor. Generally, when you increase the inductance of a pickup you also increase the resistance and capacitance of it. "Virtual Vintage Technology" however allows DIMarzio to increase the Inductance WITHOUT affecting the resistance or Capacitance much if at all. DiMarzio accomplishes this by inserting additional materials between each polepiece to increase the amount of total inductance. In Dimarzio's case, they use small headless screws inserted between each polepiece which are hidden underneath the bobbin top. With humbuckers you won't be able to see the additional screws at all unless you take off the bottom mounting plate. However, on some newer single coils you will see additional holes drilled between each pole piece, that's where the additional screws go into. (I'll post a pic of this later). Now, that's all great but I'm pretty sure all you care is about what it does to affect the tone. Virtual Vintage Technology in the most simplistic sense just takes away the harshness/shrillness on high notes (rounds them off) without affecting the tone of the low notes preventing them from getting muddy. 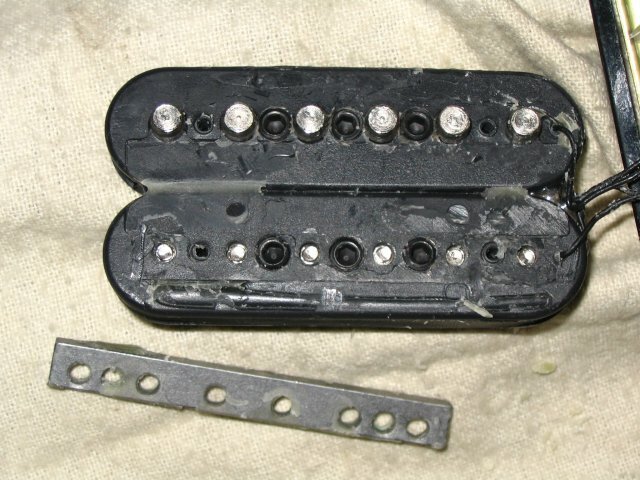 It's rather ingenius because normally what pickup manufacturers do to cut back on a pickups harshness is to give the pickup more winds, but that also affects the pickups resistance and capacitance and results in a pickup where the top end is smoother but the bottom end is either muddy or thin. Virtual Vintage Technology fixes this. BUT HERE'S THE BEST PART.... If DiMarzio is like most Manufacturers, then they use a single standard type of bobbin for everything. Which means it's entirely possible for you to mod a pickup to kinda recreate the whole virtual vintage thing. After wiring up a set of Dimarzio Evolutions for a client, I noticed that the ISCV2 actually has 5 extra holes on the bottom between the pole pieces that accept some screws in them. I'll definitely have to get myself a set of new Dimarzios and do some experiments. SO THAT"S HOW THEY DO IT!! That's very cool. What kind of screws could you use to fill the gaps? But in all honesty, as cool as this sounds, I think I'd prefer pickups without VV technology, I like high-end shrillness (I'm a strat guy), and I think DiMarzio should still keep making pickups in which they can satisfy those of us who like high, clean single coil tone but want humbucker output. But that's for another thread. I'm a strat guy too, and shrilly thin highs and muddy/flubby lows don't appeal to me either. In fact I think this plagues a lot of strat pickups in a bad way. I don't think VV equates to anything less than making the highs just as present/clear, just without the ear bleeding nastiness...thinness.....but sometimes you just can't satisfy some folks lol. It's either one extreme or the other. On the subject of buckers with VV..Paf Joe is probably one of the best medium output neck buckers out there....it does exactly what dimarzio says. All the articulation and clarity up top without the ugliness and thinness, and clear lows that are still phat. There's also another thread here where someone tested this mod with a Dimarzio Norton. The results are actually pretty good. I totally agree with having something else to mod up and alter your tone with other than just swapping pots, magnets and pole pieces. could using stainless screw? any effect? Maybe as long as it conducts. Probably. Now that I think of it even more, you probably could vary the amount of inductance that is generated by the VV mod by using screws of different metals. Since Nickel and Zinc conduct a lot more than say iron and steel, you probaly could vary the amount of effect that the VV mod does by using a iron/steel screw if using a nickel/zinc one is too much. the pup is essentially a air bucker(no metal between the magnets edge and the pole) then you fill the gaps between the poles sides so it is a continuous field? any pics of this mod? You're right about filling the gaps between poles, but I don't think the end result is an airbucker-type pup. if you squint, you'll see the extra screws between the polepieces. LOL, the funny thing is, I thought you were serious at first and actually squinted... d'oh!